The star of Pretty Woman wanted to make a movie about Alexander Pushkin, but instead of Gere in the lead role Hollywood executives wanted Michael Jackson to play the great 19th century poet. Richard Gere first came to Russia during Perestroika in the late 1980s, and his most recent visit was last November when he came to Moscow to introduce the nominees for the BraVo music awards. BraVo is a new Russian award in classical and popular music. Gere was accompanied by vintage celebrity, Sophia Loren, as well as by veteran performers Duran Duran and Natalia Imbruglia. In his speech, Gere expressed a belief in the award’s great future and mentioned that his first visit to Moscow was in 1989. In 1989, Gere arrived in the USSR at the invitation of the International Moscow Film Festival, but he had time for a trip to Leningrad (St. Petersburg), visiting the apartment of Alexander Pushkin where the poet died in 1837. The story of the poet killed at the height of his glory in a duel protecting his wife’s honor, fascinated the American actor. After returning to the U.S., Gere wrote to director Sergei Solovyev, whom he met at the festival, expressing an interest in making a movie about Pushkin. Gere said he couldn’t get the poet’s life story out of his head. “Let’s make it despite the odds,” Gere told Solovyev and invited him to Hollywood. Their plan called for making the movie in the U.S. with Gere in the lead role, and Solovyev as director. Thanks to his enormous popularity after Pretty Woman, Gere had the clout to approach the heads of several major film studios for support. “One Hollywood big shot told Gere: ‘Why are you so obsessed with Pushkin? Sure, he’s a great Russian poet. But before starting this psychological offensive on us you could have inquired about Pushkin. He was black [in fact, one of Pushkin’s great-grandfathers came from North Africa] and you’re not… We thought it over and we’ll do the project but Michael Jackson plays Pushkin,’” recalls Solovyev (link in Russian), who was shocked by the idea. And so, the Gere-Pushkin project died at that point. 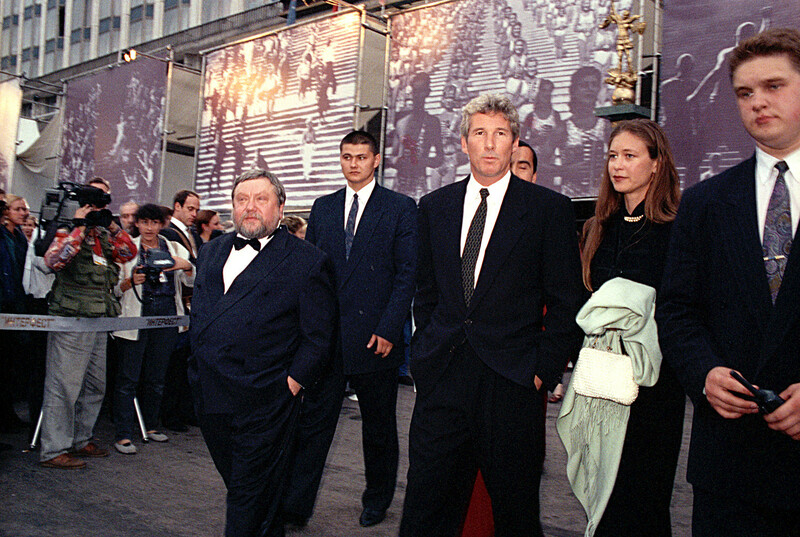 Several years later, in 1995, Gere again attended the Moscow Film Festival, this time as a chairman of the jury. There was such a fuss over him that he wasn’t allowed to even walk a few meters to the press conference in the building next to his hotel. The organizers insisted calling for a limo, and Gere had to spend 40 minutes travelling this way to his destination. Gere turned out to be a tough chairman, however; that year no one was awarded the festival’s main prize. Pushkin was not the only Russian legend that impressed the American actor. Medieval icon painter Andrei Rublev also had the same impact. During one of Gere’s visits to Moscow - he came with girlfriend Cindy Crawford in 1990 - the actor wanted to grasp the essence of Russian icons, and so, they visited the museum of ancient Russian art. “Once again, like with Pushkin, he went nuts, simply insane over Russian icons. He was greatly impressed by Rublev and Theophanes the Greek. And, of course, [Rublev’s most famous icon] “Trinity” stoked his imagination the most,” Solovyev claims (link in Russian). 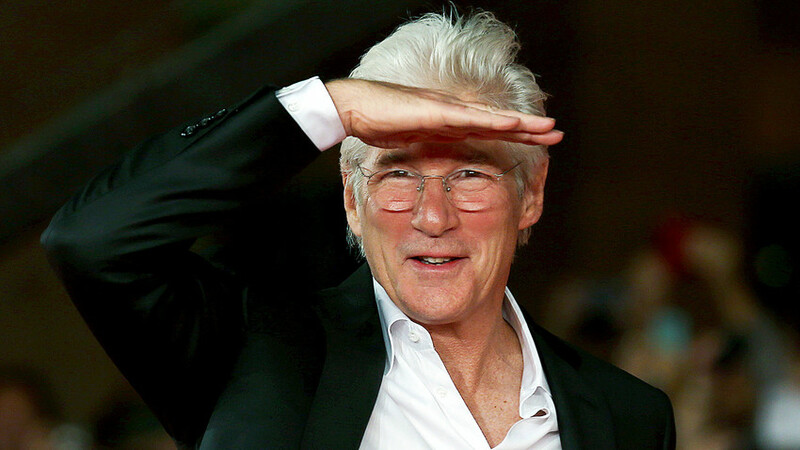 “Once again, like with Pushkin, he [Richard Gere] went nuts, simply insane over Russian icons"
Rumor has it that during this trip Gere wanted to clarify things with Crawford. Clearly, it worked out as Gere had hoped because the two soon were married. Another time, Gere was introduced to how Russians could buy alcohol at night, when liquor shops were closed. Together with Solovyev, Gere went to one of Moscow’s train stations at 2 a.m. A man met and escorted them downstairs to a boiler-house. There, the Hollywood star and the Russian director were given two bottles of cold vodka and three pieces of grilled chicken fresh from one of the boilers. Buying food and drink from a train station’s boiler-house impressed the star of American Gigolo no less than a viewing of Rublev’s icons. 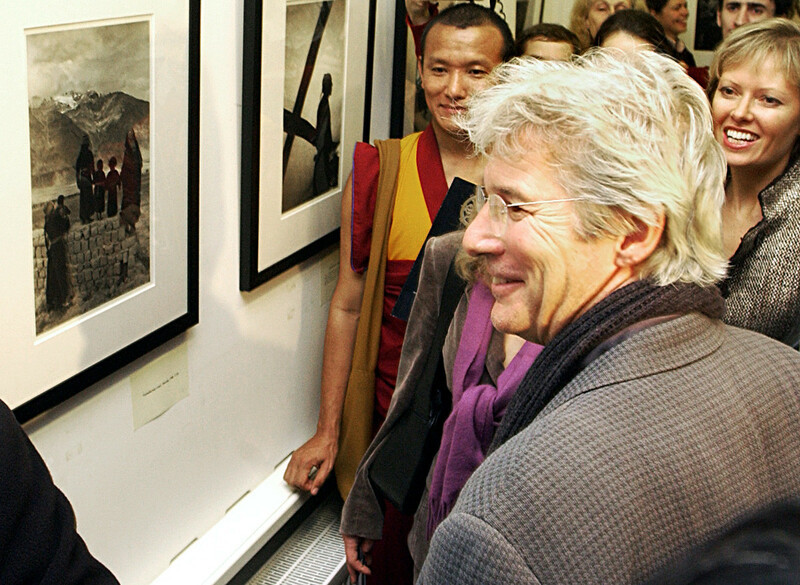 Gere, who is a Buddhist, is also known as a good photographer, and in the mid-2000s he brought to Moscow his exhibition of photographs devoted to Tibet. According to media reports, that visit did not include any memorable episodes like a decade earlier. When presenting his photos Gere talked about Buddhism, somewhat disappointing journalists because in real life he did not correspond to his cinema image of the macho-millionaire that was ingrained in the heads of people after Pretty Woman. The actor was now more interested in philosophical conversation. In 2004, media reported that Gere wanted to meet President Putin to discuss the plight of those infected with HIV but the meeting did not occur.